President Donald Trump listens during an event to sign an executive order on health care in the Roosevelt Room of the White House, Oct. 12, 2017, in Washington. President Donald Trump, who is no stranger to political chaos, found himself in turbulent times this week. Trump faces critical foreign policy challenges on Iran and North Korea and he remains frustrated with the prospect of a stalled domestic agenda at home. Adding to the turbulence in recent days was the president's Twitter feud with Republican Senator Bob Corker of Tennessee and a resurgence of Trump's long-running spat with the mainstream news media. White House Chief of Staff John Kelly calls on a reporter during the daily briefing at the White House in Washington, Oct. 12, 2017. On Thursday, White House Chief of Staff John Kelly made a rare appearance before reporters at the daily White House briefing to knock down reports that he is frustrated in his job. "I don't think I'm being fired today, and I'm not so frustrated in this job that I'm thinking of leaving," Kelly said. As for Trump, even as he highlighted tax reform at a rally in Pennsylvania Wednesday, he complained again that he has gotten little credit for his achievements so far. "The confidence in our country is back like it hasn't been in many, many years," Trump said to cheers at the event in Middletown, Pennsylvania. He seemed a bit wistful at one point about his life before politics: "I had a very good life. But you know what? I am having a better life now and I'm helping a lot of people." 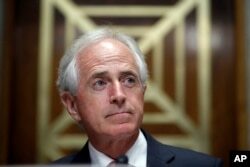 Chairman Bob Corker, R-Tenn., pauses before a hearing of the Senate Foreign Relations Committee on the nomination of former Utah Gov. Jon Huntsman to become the US ambassador to Russia, on Capitol Hill, Sept. 19, 2017 in Washington. But the president has been irritated this week over criticism from Senator Corker, warning that Trump's temperament and rhetoric could risk "World War III." He also lashed out at the media in the Oval Office over reports from NBC News that he wanted to expand the U.S. nuclear arsenal by a factor of ten, something both he and his defense secretary denied. "And it is frankly disgusting the way the press is able to write whatever they want to write, and people should look into it," he said. Trump's rally in Pennsylvania was an attempt to refocus attention on tax reform. He is eager for a legislative victory he can point to in advance of next year's congressional midterm elections. But Republican divisions over the issue and the opposition of Democrats pose a threat to the tax plan being enacted. 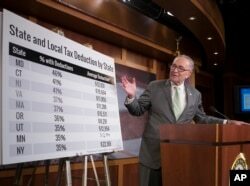 FILE - Senate Minority Leader Chuck Schumer, D-N.Y., uses charts to contest the Republican version of tax reform, during a news conference on Capitol Hill in Washington, Oct. 5, 2017. "They say it is tax cuts for the middle class. It's not. It is aimed at the rich," Senate Democratic leader Chuck Schumer said. Success on tax reform is also important to Republicans, especially those running for re-election next year. "The best way for us to help people and advance our principles is that we stay unified and advance this agenda that we are working on like tax reform," House Speaker Paul Ryan told reporters at the Capitol. Amid what some see as chaos on many fronts, Trump continues to turn to his political base for solace and support. "I think he still gets the populist moments," Republican strategist John Feehery said. "He still gets the fact that Washington is extraordinarily unpopular. He understands that the media is extraordinarily unpopular with the Republican voters." But Feehery added that the president's habit of picking fights with both opponents and allies continues to provide major distractions from getting his agenda passed in Congress. "His biggest problem right now is that the national media does not like him. The Republican Party, by and large, the establishment, does not like him," he said. "Democrats obviously hate him, and so it has been very difficult for him to gain any traction, and there is also the problem of his own volatile nature." Despite the recent turmoil, Trump is counting on his core supporters to stick with him and he made that clear to the crowd in Pennsylvania this week. "You finally have a government that is going to defend you and stand up for you and your country," he told the crowd. Analysts say for the most part Trump's base is hanging with him. "With 38 percent of the electorate, 80-plus percent of the Republican Party strongly behind him, it is unlikely that we are going to see a lot of Republicans break from him and really challenge him in meaningful ways," George Washington University political scientist Matthew Dallek said. But all that focus on shoring up the president's base does come with a political cost, Gallup pollster Frank Newport said. "For him to get a higher approval rating, he has got to somehow move those Democrats and some independents, where he is getting about a 30 percent approval now, and that is very hard," Newport said. In the latest Quinnipiac University poll, Republicans approved of the president's job performance by a margin of 81 to 12 percent. His overall approval rating was at 38 percent, up slightly from last month. That is about even with the job approval average of several polls calculated daily by Real Clear Politics, which has Trump at 38.8 percent approval, 55.4 disapproval.